Wick Football Club have begun their search for a third chairman in just under a year. The Crabtree Park side were rocked when Dave Usher announced his decision to step down from his position over the weekend. Usher returned for a second stint as club chairman back in December but has now decided to walk away less than two weeks before Wick begin their Southern Combination League Division 1 campaign. 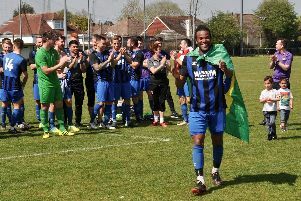 Ambitious Rodney Lampton took over as chairman last August - with former Premier League star Marcus Bent joining the club soon after his arrival before leaving without making an appearance - but stepped down less than four months later due to personal reasons. The timing is far from ideal for all involved at the club with the new season edging closer. A Wick official said: “‘We’re moving things along on and off the pitch and despite this small bump in the road, we won’t let it affect our preparations for the new season. Usher felt he wasn’t the right person for the job at this time and said: “The main reason I stepped down was I lost the enjoyment from being in the role. “The constant worry over not enough money coming into the club was another contributing factor and I didn’t feel we had enough backing from the local community. Newly-appointed secretary Trevor Knell and president Keith Croft will look after the running of the club until a new chairman is found. Applications for the vacant position are being accepted, anyone interested should email wickfootballclub@outlook.com, Facebook page, www.facebook.com/wickfootballclub, tweet @ WickFCNews or call 079566 00995.